The best way to get a ‘feel’ for what the 2015 Louisville Manufactured Housing Show will be is to look back to the 2014 Louisville Show. For the second year in a row, the 2014 Louisville Manufactured Housing Show was the best attended event in all of manufactured housing! Well over 2,000 industry pros in total came and they can’t all be wrong! This video below will give you a fast paced recap of the 2014 Show, as seen through the eyes of those who were there! Notice the upbeat, enthusiastic mood? That enhanced confidence in the industry and our future should be even stronger at the 2015 Louisville Manufactured Home Show. Click on the rectangle in the bottom right corner of the video player. Part of what makes a trade show like Louisville a great opportunity is the fact that corporate leaders and industry legends are often present. You can walk up and talk to your company rep, but you can also meet corporate and association leaders. We will bring you here on the Louisville Show’s official blog a series of videos and updates, so keep checking back to get the latest on when registration opens, who will be exhibiting in 2015, the educational and business building seminar line up and much more. Our first video interview will be a behind the scenes look with the Show Coordinator, Dennis Hill. This video begins with a brief discussion of Tunica, but is focused with a look at the Louisville Show’s strong come back. The Show Dates are January 21-23rd, 2015. Future videos here will include ‘home tours,’ video interviews and more! You can download the first 2015 Louisville Manufactured Home Show Newsletter, at this link here. You can read the first article about the 2015 Louisville Show by Chairman, Ron Thomas Sr., at this link here. Music! Mixers! Popular Business Building Seminars, many were standing room only! Great deals on products! Services from top suppliers, that you can compare side by side! There is something for almost everyone who is in or considering entering the manufactured housing arena. 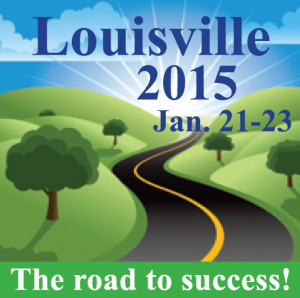 Mark your calendar now for the 2015 Louisville Show. Please watch this blog for updates on when registration for attendees and discounted rooms at the Crowne Plaza hotel opens.